TBILISI (Sputnik) - Mikheil Saakashvili, the former Georgian president and currently an opposition figure in Ukraine, from where he was deported to Poland, said he planned to return to both Georgia and Ukraine to change the situation in these two countries. "I will return to Ukraine, because I have a legitimate right to live there. I will also return to Georgia. Oligarchs' rule will come to an end much sooner than expected… In the existing circumstances, it is important to return and change the situation in both countries," Saakashvili said in an interview with Georgian Rustavi 2 broadcaster. 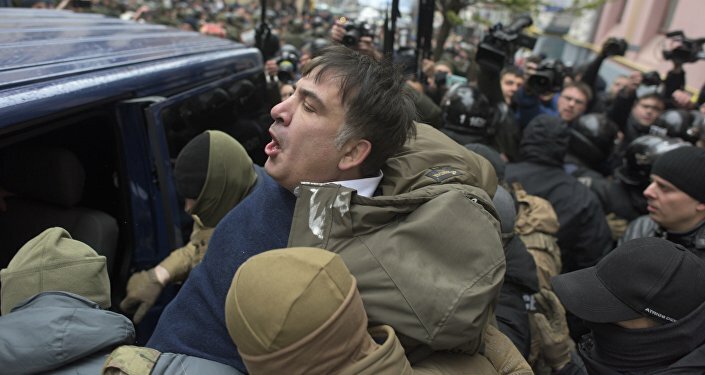 Saakashvili noted however that he planned to fly to the Netherlands later on Wednesday. The politician is married to Dutch national Sandra Roelofs, with whom he has two children. "Then, I plan to move across Europe because I have meetings planned in Brussels, in Germany, in France, than again in Poland," Saakashvili pointed out. Saakashvili also refuted claims that he had asked German Chancellor Angela Merkel to support his activities against Ukrainian President Petro Poroshenko. Such claims have emerged after Saakashvili said in an interview with Bild newspaper, published on Tuesday, that Ukraine would be destroyed unless the European Union, particularly Merkel, takes action in this situation. "I know Merkel very well, but I have not addressed her," Saakashvili pointed out. On Monday, Saakashvili was deported from Ukraine to Poland from where he had illegally entered Ukraine in September. In July, Saakashvili was stripped of his Ukrainian citizenship while his was visiting the United States, after it was revealed that that he had provided incorrect information on his citizenship application. According to Ukrainian media reports, Saakashvili had covered up his criminal record in Georgia, where he faces various charges, including embezzlement. Over the recent months, Saakashvili has been leading anti-government rallies in Kiev, calling for the impeachment of Poroshenko and well as for the introduction of legislation to fight corruption in the country.